The Hungarian State Opera in Budapest (Magyar Állami Operaház) is one of the most famous and beautiful theaters around the world. With its splendor decoration it amazes everyone who visits it. For musical aesthetes, it is a real Mecca. Acoustically it is one of the three best European theaters, after Milan's La Scala and the Paris Opera. The building itself is a real architectural masterpiece, capable to surprise the most experienced critic. Opera performances were appreciated by Hungarian aristocrats, in the houses of which they were staged since the 17th century. Since 1837, the opera company has worked in the building of the National Theater. After the unification of Budapest in 1873, it was decided to build an opera house. The initiators were well-known Hungarian composers Ferenc Liszt and Ferenc Erkel. By the way, the latter became the first head of the theater. In 1875, the construction began and it was headed by the local architect Miklós Ybl. Along with the Andrássy Avenue, the theater became the crown works of the Hungarian master. The building was executed in the Neo-Renaissance style, and the Baroque influence is traced in the ornaments and sculptures. September 27, 1884 there was a premiere, to which the Austro-Hungarian Emperor Franz Joseph was invited. During the Second World War, the theater almost did not suffer, and in 1945 it resumed its work. In 1950 the hall was expanded and refined. In 1979, the city authorities closed the opera for restoration, which ended in 1984. For the years of its existence the theater has been headed by many famous personalities, including Gustav Mahler and Arthur Nikisch. Thanks to the skillful leadership, it achieved worldwide fame after several decades. The most brilliant composer Giacomo Puccini staged his operas, and many great composers and artists worked here. Among them are Montserrat Caballé and Luciano Pavarotti – world stars known even by those who are not interested in music. If you come to Budapest, be sure to visit the Opera house. You will remember this amazing structure for a long time. Slightly sloping base emphasizes the monumentality of the whole building. The majestic marble sphinxes of the sculptor Alajos Stróbl are situated at each corner. In front of the entrance there are sculptures of the founding fathers of the theater Ferenc Liszt and Ferenc Erkel. On the frontal projection, in niches, there are bas-reliefs of muses, and the upper terrace is decorated with statues of 16 famous composers. Marble and gold predominate in the foyer. A double staircase leads from the lobby to the entrance to the hall on the first floor, on which 4 statues are installed. Except for gold, the ceiling above it is decorated with 9 magnificent paintings by the artist Mór Than. The main hall is three-level and has a horseshoe shape. It can accommodate 1261 visitors. It is dominated by red and gold colors. The ceiling is decorated with a beautiful fresco by Károly Lotz. The hall is lit by a large bronze chandelier, which is lowered twice a year on the winch to replace the lamps. From the side of the Dalszínház street to the upper gallery leads the Royal staircase. Temporary exhibitions of valuable and memorable things of the theater are held here. Going further, you can get to the hall of Bertalan Székely authorship, richly decorated with gold and oak carvings with Rococo-style ornaments. It is used for small concerts and press conferences. The theater's buffet is also richly ornamented with gold and wood, and on its ceiling there are beautiful paintings of Hungarian artists. 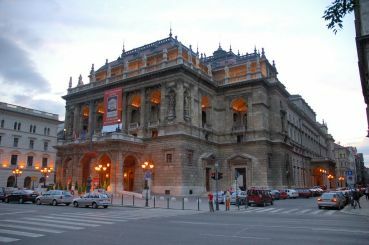 The Budapest Opera House is located on the Eastern bank of the Danube, near the Hungarian Parliament, on Andrássy út 22. Also to the West of the Opera there is the St Stephen's Basilica. It will be very convenient to get there on the metro, the M1 branch, go to the Opera M station. Also near the theater there are bus stops (routes 105, 979) and trolleybuses (routes 70, 78). The name of the stops: Opera M and Andrássy út, respectively. Opening hours: every day from 10:00 to 17:00. Phone number (+36) 18147100. Entrance fee: ticket prices depend on the presentation. Tickets for excursions: full – 2490 Hungarian forints, for students – 2200 forints. The price includes a mini concert, presentation and photo shoot. Data of February 2018.